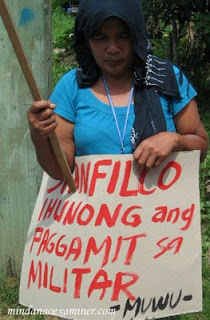 Banana plantation workers who are members of the Maragusan United Workers Union and ANAKPAWIS held a picket Friday, October 30, 2009 in Davao City in Mindanao to protest against union busting and labor malpractice. 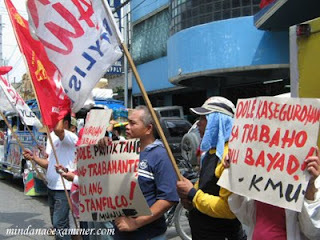 DAVAO CITY, Philippines – Filipino banana plantation workers on Friday picketed in front of the local Labor office and at the headquarters of their employer Stanfilco to condemn alleged repression and union busting activities. 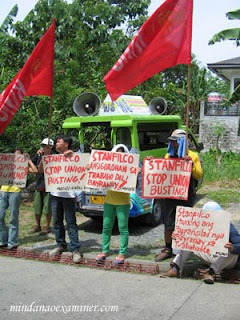 Zoilo Ebora, chairman of the Maragusan United Workers Union, claimed the Stanfilco management had been offering one time payment in exchange for the resignation as regular workers. 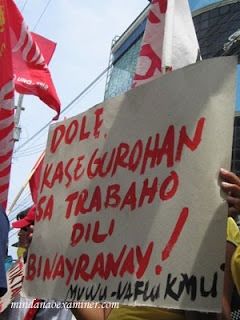 He said the union submitted its complaint to the National Conciliation and Mediation Board. 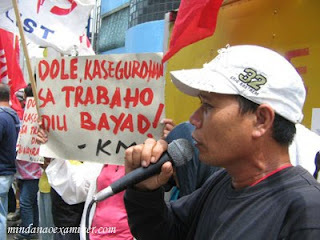 Romualdo Basilio, Anakpawis party list provincial spokesperson, has expressed support for the plight of the union workers and lambasted the Stanfilco.